Medford Indians had a great showing in Gloucester Township’s All-Star Tournament. 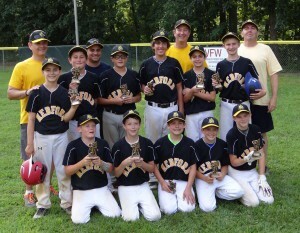 The Medford Indians, a 12U team comprised of in-house all-stars, took second place in Gloucester Township Baseball’s All-Star Tournament on July 24–26. “The bats were alive and featured home runs from Michael Stoughton, Mason Minnium, Evan Miserendino and Donovan Dougherty. Our pitching complemented our great offensive effort very nicely. I’m very proud of these boys for the way that they came together quickly and were able to put forth this effort,” Head Coach Mike Stoughton said.